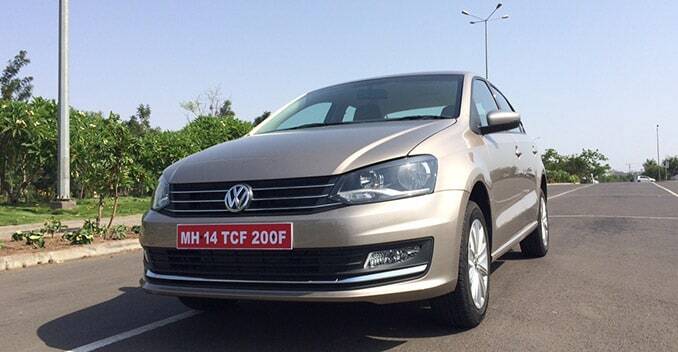 The new Volkswagen Vento is only so new. Yes that is pretty much how it goes for most facelifts I know, but some mechanical changes would be nice too, eh? Okay I will play nice - because the superficial changes on the Vento are many, and credibly carried out too. The first impression is that the car appears more grown up, wider and more high-end than it did. The Vento always had a smart European design, but now it looks more like its elder sibling - the Jetta. Simple chrome strip inserts in the front and rear bumper, and tailgate, plus a slimmer, more rectangular fog light and air dam design has achieved the wider look. The car looks bigger as a result and this is enhanced by the three-slat chrome grille and a new attractive head lamp design. The fogs also serve as cornering lights for that extra illumination when turning and helps especially while parking in the dark. The hood gets deeper crease lines, which are not immediately noticeable as different, but accentuate the bigger face for sure. The taillights are also new with a nice LED-like pattern. And there is some chrome thrown in for added measure to give that premium look. I have to say unlike my usual aversion to chrome, this works. I'm talking about a subtle chrome addition to the top of the door handles, and the chrome tipped exhaust. The boot release now has a soft-touch pad on the tailgate that again adds to that high-end quotient. On the inside I had to be told that the colour scheme is totally new. It doesn't come across as something we haven't seen before, though the palette is now Walnut Desert beige. Once I got past the fact that the name describes the two shades used and that walnuts are indeed impossible to grow in the desert, I checked out the cabin. It carries the same features, and good quality feel as before. I would have liked to see a nicer large-screen integrated infotainment system with navigation perhaps, which would have instantly been seen as a major upgrade, but no such luck. You do get a cooled glove box though! The car now has cruise control, and Volkswagen says efficiency has gone up 7.5% by tweaking the engine tuning. No mechanical changes as I said at the start, and so that means the car drives as it used to. I drove the DSG gearbox diesel variant, and can vouch for it. It is still the best combination available in the market. Handling and ride quality remain segment leading as well. Expect a minor price revision when the car goes on sale.